This morning as Lauren was getting ready to board the school bus, a bird soared through the air with an iguana in its beak. The bird crashed into our gate, the iguana fell, and Lauren’s head missed being hit by a fraction of an inch. 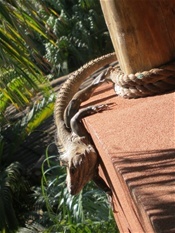 The iguana lay stunned on the ground for several minutes and then dashed out of sight, safe for another day.